Advanced Font Viewer is a comprehensive application, which is ideal for viewing, printing and managing your fonts. You will be able to simultaneously view all fonts installed, view previously uninstalled fonts and install them, print list with type specimens, and uninstall unused fonts. The simple user interface is designed to guarantee quick access to the tools. There are many customization features as well. Many options can be customized to suit your preferences. FontExpert enables you to preview and manage both installed and uninstalled typefaces, plus examine your system for font errors. You can display the list of installed font faces, customizable font samples and advanced font properties. The program allows you to print different types of reports, and offers many printing options. MainType is a powerful font manager for Windows that offers a straightforward and easy-to-use interface to help you maintain your fonts. It includes features for novice users who just want to view and install fonts as well as advanced features for graphic designers and typographers. In order to find the right fonts for your needs, the software includes filter and sort functionality as well as a font information pane that reveals important typographic data. The groups pane helps you quickly organize your font collection. OpenType, TrueType and Type 1 Font Management (except Multiple Master). List, print or inventory the font families scattered in your machine, with all variants, whether installed or not installed. Detect and correct font installation problems. Optimize your machine and your efficiency by using font groups taylored to different needs. Font manager for OpenType, TrueType, PostScript Type 1 and printer fonts. Previews all fonts. Displays all font properties (typeface classification, kerning pairs, file data, copyright...). Views character set, keyboard layout, zoom view. Finds similar fonts and compares several fonts tabularly. Prints fonts in many ways. Manages fonts in database and font groups. Font file management functions. Typograf searches fonts and duplicates on your harddrive, CD-ROM's or DVD's. Sorting fonts by file, name, family, size, copyright, width,... You can edit the file information (name, copyright). You have favorites and history of viewed directories and Tag for viewing and printig fonts. Font Viewer, Font Manager and 3D Graphic Program. The free version is fully functional for Truetype/Opentype fonts, and registered users get the following bonus features : preview Postscript Type 1 fonts, print not-installed fonts overview, create transparent GIF pictures, blurred shadow effects, outline font effects, filter on not-installed fonts. Quickly view all fonts currently loaded on your system. Users are able to quickly scroll through each font getting a custom preview of their choice (backcolor, text color, and text displayed). Also, be able to view and install fonts from any directory, CD, or folder. Use the Slideshow feature to cycle through the fonts, displaying a preview, with no user intervention. 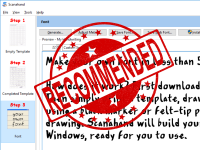 FontExplorer X sets a new standard for font management software. Font management, font sorting, font shopping and font discovery are simple and fun ! FontExplorer X gives computer users all the functionality they ever dreamed, easy to use with an elegant style. Displays all fonts on your computer, installed or not. You can compare them with your own text, display the full character set with the corresponding code. You can create groups of fonts, install or uninstall fonts or groups of fonts at once in the Fonts folder. Fontomatic is a freeware fonts tool for adding and removing fonts from Windows quickly, easily and in batches. Windows loads all fonts at startup and so it is important to optimise your PC by removing these fonts by copying them to a seperate directory and adding them only when needed. This is one of the main benefits of fontomatic - it allows you to add directories of font files really quickly. Universal font convertor. In seconds you can convert any outline font to almost any other format on Mac and PC (PC Type 1, PC TrueType, Mac Type 1, Mac TrueType, PC Multiple Master, Mac Multiple Master). CrossFont is a Windows program that can convert TrueType and PostScript Type1 fonts between Macintosh and PC platforms. Features include long file names, automatic file recognition, drag and drop, folder searching, NT SFM support, hinting and internal font data is not changed. Macintosh software, to convert PC TrueType fonts into Mac TrueType fonts, and conversely. The editor lets you easily select and modify the entire character set of any TrueType font and fonts based on OpenType font technology. Features include the ability to convert (scanned) images to outlines, thus enabling you to create fonts with your own signature, logo and handwriting. FontLab Studio is a next-generation professional font editor for Mac and Windows. It is the comprehensive solution for font foundries, professional type designers, typographers and graphic design studios, allowing them to design type, create and modify fonts. FontLab Studio supports all major outline font formats, including Type 1, TrueType, Multiple Master and OpenType. TypeTool is our basic font editor for Mac OS and for Windows. For students, hobby typographers and creative professionals who occasionally need to create or customize fonts. Create new fonts or modify existing fonts, open any fonts installed on your system. It's never been easier to make your own custom fonts. Scanahand allows you to generate fonts without the need to know all of the technical details involved. Simply print a template, draw all of the characters and your signature using a black marker or felt-tip pen, and scan your drawing. Scanahand will build your font, and install it, ready for you to use. It's easy and fun, so give it a try and add a personal touch to your computer! TypeBridge closes the gap between Illustrator and FontLab by fine-tuning your characters for importing. Once you've drawn your characters in Illustrator, you simply select your characters, run the script, and all of your anchors are automatically (and carefully) nudged to the closest whole integer, in a way that is practically unnoticable. What you will notice is that the integrity of your typeface remains intact! A desktop font identification solution that looks at the fonts on your computer, instead of comparing against every font available on the Internet. All you have to do is supply FontMatch with an image file, and then specify what character this image represents. FontMatch can search through the fonts on your machine, and display a percentage for each one that represents the closeness of the fit. What used to take hours now takes only minutes. A desktop application that reads images and then goes through all the fonts on your computer and matches the letters in the image against the fonts installed or located on your computer. You are provided with a list of matching fonts along with the matching accuracy for each one. You may also type text and see how well the matching went. It's ideal for graphic designers and creative professionals who would otherwise spend hours trying to find a matching font. FontDoctor is a powerful font problem diagnosis and repair tool. It will scan font folders (on local hard drives or over a network) to locate and repair common font illnesses, including missing Postscript fonts, missing bitmaps, corrupt/damaged fonts, mixed fonts types, and lots more. True Font Family is a script in order to use True Type web fonts as if they were supported by current browsers. This means, you can use any font on the Internet using standard CSS without any kind of manual work. Just install it once and start using your .ttf font files. It will save a lot of time and offer new possibilities. Renames the fonts files with their real name. FontTwister lets you create impressive text effects for web pages, illustration, multimedia projects and presentations in seconds. Add glows, bevels, embossing, transparency, texture, edges, soft shadows and blurs to your text or apply one of the dozens of built-in styles.